So, there I found myself, pointlessly poking around various maps online, and I noticed the name "McCarteney" in an area I wasn't aware had any communities. "Time to open up Google Earth," I thought to myself, and I found myself amazed. There, in the middle of nowhere that is Eastern Washington's Moses Coulee, was a variety of buildings that could be a ghost town. (Image here) From the aerial it's hard to tell, but it looks like there's some kind of railroad grade loop, foundation, and odd line of strange buildings. I tried looking for info on Google, but absolutely nothing comes up when "McCarteney" and "Washington" are combined in the same search. However, poking around Google Earth some more, I discovered something that makes the mystery so much more interesting. A panoramio image shows the row of buildings to be some form of shed type things, a very large, odd looking shelter, and most impressive, a large old wooden grain silo-type structure. This really looks like something more than just a farm, and it's got me curious. Does anyone have any info? 1952 Hammond's World Atlas does not show McCartney. It does, however, show Farmer and Suplee. Supplee is on a Great Northern RR track that has an end of the line a Mansfield, and goes south to Withrow, Supplee, Douglas, (with Spur to County Seat Waterville,) and further south to Alstown and Palisades. -Farmer is already listed on GT.com as having abandoned, empty stores and such. Does appear on 1952 map. -Dyer, also listed on GT.com, is not shown on my 1952 map. Looking at the areial images of McCartney, I too find the loop to be interesting. I wonder if it isn't an old racetrack. Was Coulee Meadows a race track? grandstands! For watching the race! The smaller "ring" near the "grandstands" could be an arena for rodeos or whatnot, which became more popular as racing declined. Of course, I could be totally wrong and this could be one giant stockyard where livestock would be rounded up prior to being loaded onto trains...but why would one make a giant loop just like a race course for that purpose? Last edited by Tsarevna; 12-13-2009 at 10:19 AM. Looks like an irrigated field from here, it's just not a complete circle. The large building on the right looks like some sort of grain silo. I'm not talking about any sort of circle...I don't think you are looking at what I am speaking about. 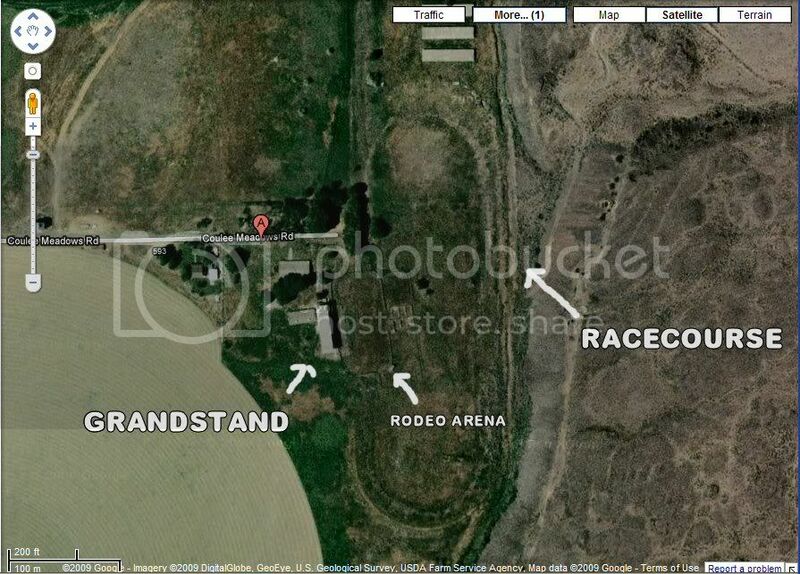 But the rodeo arena in the race track? The race track looks like it needs to be more symmetrical, too. If you look at the photo of the building close-up, it sure looks like silos. Last edited by JoeZona; 12-13-2009 at 11:39 AM. According to the Douglas County Assessor, the land is owned by Robert E Rummel, the closest Robert E Rummel I could find is in Yakima, (509) 453-3008. Um, Hi Mister, do you have a racetrack in your backyard? The reason I think that might be a rodeo arena is because that's what they did with the racetrack in Salem, Oregon. They used the existing grandstands that were there (after shutting down the track,) for rodeo fans during the State Fair for some time. Edit: I have an idea, why not call the Douglas County Historical Society on Monday? No reference to the town yet, but I did find a map showing the proposed Northern & Southern Railway through Moses Coulee to Waterville and St. Andrews, passing through where McCarteney is. As for the earlier mention of St. Andrews, from what I know, it is a bit of a ghost town. I haven't been there, but I know it has an old grange hall and a cemetery. The map I was checking out is here, and also shows some other potential ghost town sites such as Jameson, Bright, Buckingham, and St. Germain.